Dealing with Alfdaín presented the challenge of generating Elvish names without sounding too much like a Tolkien-wannabe. The names used here blend Nordic-sounding syllables, old English/Germanic, and Breton Celtic. I reverted to plain modern English for geographical features, like bays, forests, and mountains. I may yet invent a new language, as I already did for the dwarves. Instilling some rhyme and reason to all these fancy words may be just the thing I’ll do when the time comes to focus on Alfdaín (or Alorea). This parenthetical reference does bring up another issue. While rereading the manuscript, I noticed a curious discrepancy. All accents in Alfdaín names rise toward the right. 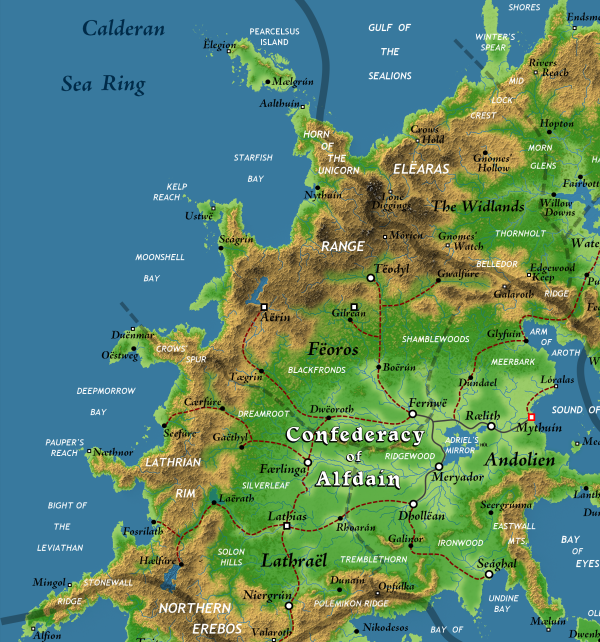 However, there is the Alorean society called Tòrr-Gàrraidh whose accents rise toward the left. If you’re tending toward OCD, the compulsion is to fix the disturbing detail, immediately nudging all accents to lean the same way. But no-no-no: any OCD predisposition on my side rests backwards and upside-down (especially on even-numbered days). I decided that Alorean accents should aim one way and Alfdaín’s the other, if you get my penchant. The logic behind the offending accents is a form of subtle intellectual mutiny only making sense among elves (and French readers). Elven grammarians on either side will never agree on which is the right way and, if given the opportunity, will probably come to bold words (no doubt appropriately accented) and italic blows over their diverging linguistic standards. The dwarves quietly snicker at the oh-so pedantic conflict. Their accents look like miniature mountains (sans serif), making everyone there ever so smug about their stonelike cultural rectitude. Further north lies Belledor. The trouble here is whether to make the names sound wild and exotic, perhaps like those from the Amazonian jungle, Papua-New Guinea, etc. On the other hand, since the fellfolk living there have shed their former culture(s) as the result of their servitude in the colonial dominions, I went for common “hobbit-like” names. At least, it’s immediately obvious what they mean, and therefore they may hint at the character of the inhabitants. But this is just an illusion. 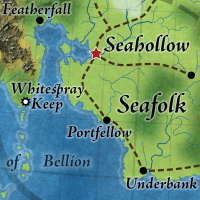 Although Belledorans seem to value peace, good food, pipeweed, and quaint comfortable homes, the naming convention has more to do with their desire to be accepted by the neighboring powers. The truth is that Belledor is the Dr. Jekill and Mister Hyde of the Great Caldera. A part of the common Belledorans’ psyche always dwells on the memory of the lost Dread Lands and on a yearning for the return of the spirit lords. Under the right conditions, the folksy varnish might just suddenly fade and reveal a very different people. This internal conflict can be seen in the land itself: see how the forests have been cleared alongside the rivers. The wood was used to build the cities and farms dotting the countryside. Yet, enlightened Belledorans find solace in their forests because that’s where they feel closest to Calidar’s world soul, perhaps even more so with escaped Alorean gnomes living there. If ever the spirit lords should walk their lands, they would first come from the forests. For better or for worse, the attraction of wealth and industry has become a powerful force threatening to forever change the ancestral ways of the fellfolk. Nordheim’s paradigm was entirely different. 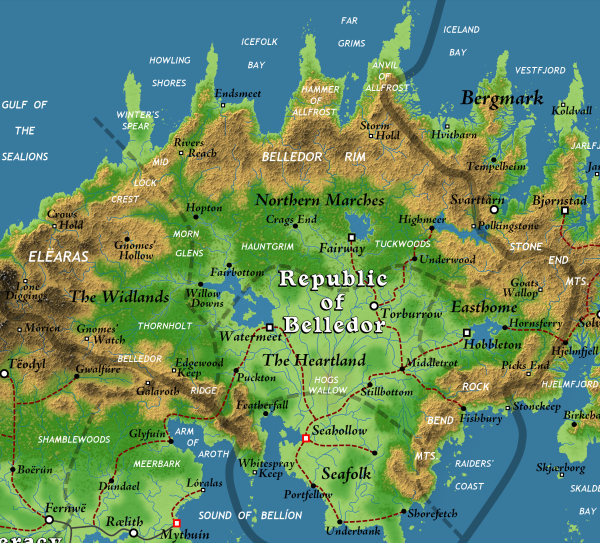 In keeping with Mystara’s Known World, a realm inspired from the Vikings of old was desirable. The naming convention here was fairly straightforward—or so I thought. For the sake of consistency (and of my own mental sanity), I selected modern Norwegian as the basis for the place names. Since I don’t speak Norwegian, there were unavoidable “honkers” in the lot, which had to be corrected. There may still be some. Then the idea that names ought to be written in archaic Norse came up, which complicated everything. Some were fine, others didn’t sound right, at least to the ears of Anglo-Saxon readers. I guess nothing’s perfect. Then again, I hope the illusion remains. The real story here is not so much about the labeling, it’s about making the map itself. 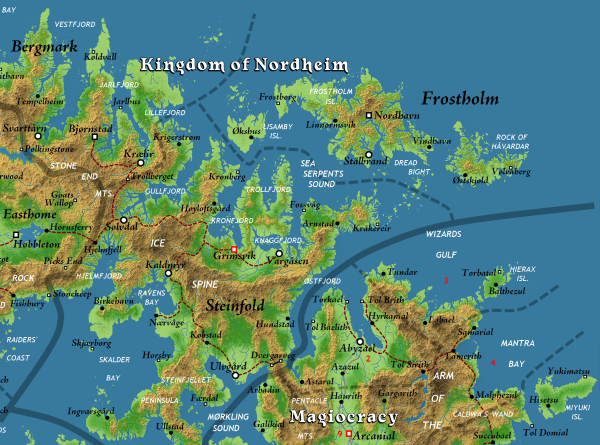 I remembered the Known World’s Northern Reaches and its “pseudo-fjords.” I wanted to avoid that problem. First, I positioned the realm way up north, away from the emirates. Next, I designed deep, narrow bays within mountains, but in time, Thorfinn Tait and I came to the same conclusion: it didn’t look enough like the coast of Norway, which was the intended goal. So Thorfinn took upon himself to add lots of islands and cut out innumerable “sub-fjords” within existing ones—a thankless and persnickety job. Then the next problem was tweaking the erosion software to force the edges of the mountains to come close to the shores, which wasn’t so in the early models. While all this was taking place, I wrote the descriptions of the Great Caldera's realms. Considering their rather huge sizes, I decided to divide these kingdoms into sovereign powers and vassal states (I may yet add some small ones here and there for more variety when the time to focus on each region comes around.) Nordheim was no exception. It is worth noting that it comprises three nations, just like the Northern Reaches. The more powerful nation, Steinfold, lies in the south. The jarls of the Bergmark hold the northwest. Nordheim's more sinister kinsmen control the islands of Frostholm. The similarity ends here. 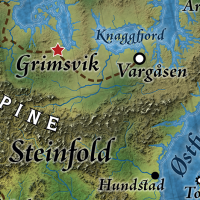 The jarldoms are the domains of werebears (hence the regional capital of Bjørnstad). The islanders of Frostholm are the bad boys of the north. They made buddy-buddies with ice spirits, leaning closer to the ideals of frozen Dread Lands. In the episode addressing Nordheim, the dwarves (the dvergar) living there will be much more visible. 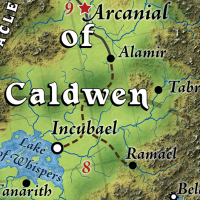 Heading back toward more forgiving climes, we find Caldwen. 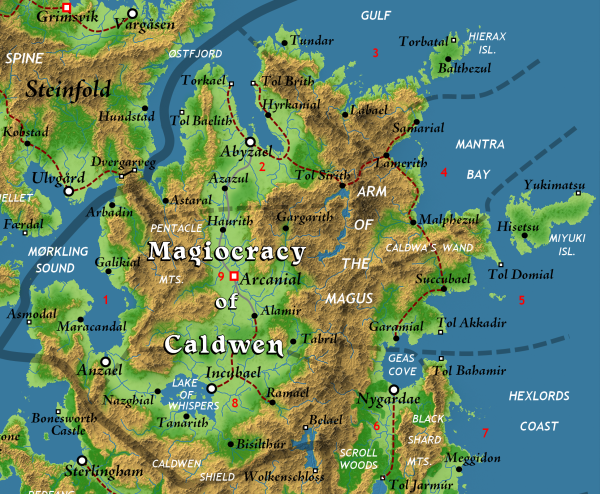 Following the logic that the original colonizers came from a part of Manaan loosely inspired from Zoroastrian Persia, the initial idea was to name places accordingly, albeit with some elven influence. It worked to a point, but I didn’t find the result entirely conclusive. That’s where one starts over and heads in another direction. The next batch was altogether much more amusing. 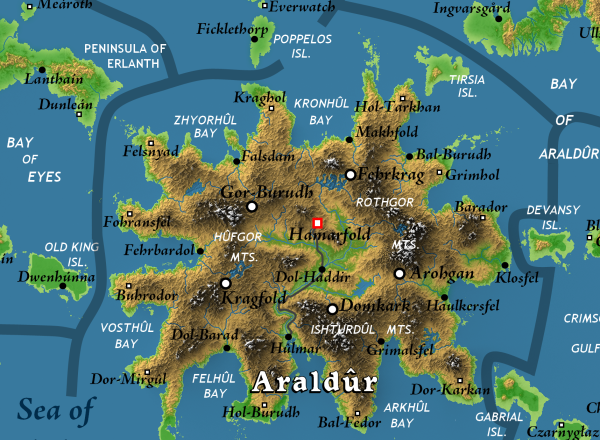 I concocted a fiendish scheme to modify names brimming with sulfurous connotations, and make them basic place names: Balthezul, Astaral, Tanarith, Incubael—you get the idea. It’s vaguely Phoenician/Semitic, rather than pseudo-ancient-Persian: perfect for wizards. They’re not bad fellows, mind you, but just plain weird. All the names for geographical features reverted to modern English for clarity and color, as was the case with the other realms, except for one island, which sounds overtly Japanese. You will probably notice a few other spots with unexpected names here and there in the Great Caldera. They came from Admiral-level Kickstarter backers who each got to name an island. Miyuki Island therefore is home to Kumoshimans stranded there after a long journey through outer space. Their means of return was destroyed in the process. Having able wizards among them (how convenient! ), they were able to become a part of the magiocracy. Ninja-mages anyone? 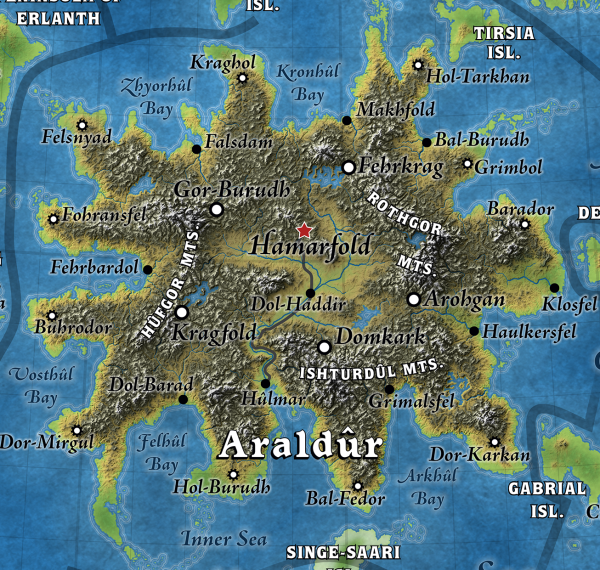 The journey through the Great Caldera’s map ends at its heart: the dwarven Kingdom of Araldûr. The place names were pretty straightforward, since I’d developed a language for the short-legged, strong-armed fellows. I ended up with names such as: Hamarfold (City of Glory), Gor-Burudh (Mount Burudh), Hol-Tarkhan (Fort Tarkhan), or Dol-Haddir (Haddir’s Bridge). Then again, I had written the language with the intent to generate geographical names at some point, so it became an exercise in mining the word deposit. 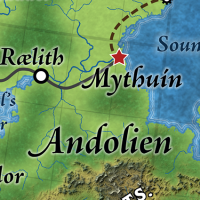 The real problem with this part of the map was getting the map labels to be readable since the background is darker than most other areas. Compare with the later version of the image shown below. Between the map version I worked on and the final iteration, the tint and shadows of the mountains changed. Some of the fonts got updated, as well as the symbols. The good news is that this poster map is now final and is headed to the printer to obtain color proofs. I may in fact have the actual poster in my hands in the next several days. That’s pretty exciting! As regards the status of the books, things are getting fairly tight. I’m waiting for the remainder of the illustrations’ final drafts, which are unfortunately behind schedule. The cover art was completed a while ago, so that part is good to go. The late June release is still in the cards, but it’s going to be a difficult target to hit. The book’s secondary maps and graphics, though already drafted, also need to be finalized. The 100lb gorilla was that first poster map. It received the lion-share of the attention because so much depended on it. Now that it’s done—and done exceeding well—the rest should fall in place fairly quickly. The second poster map will be completed pretty soon. The hex map itself is already drafted; its symbols need to be swapped for the new ones. All told, if there is a delay, it shouldn’t be too bad. The choices are whether to rush ahead or do it right and produce a really awesome book. It’s pretty clear that quality comes first.